The seminar was divided in two parts. The morning was devoted to a detailed and very informative presentation by Judy Jenner of Twin Translations. The afternoon to a panel discussion with Judy Jenner, Beatriz Bonnet, Adam Asnes of Lingoport, and Japanese to English translator Chris Blakeslee. Although the seminar was primarily aimed at translators wishing to market to direct customers, most of what was said is also useful for those of us who wish to market to translation companies. I took some detailed notes, but the following outline and comments are my interpretation of what, as translators, we should do to market our services, so I'm responsible for any error and for my opinions in this material. In particular, I've rearranged much of the material, and added links to other sites. Knowledge of languages, of translation techniques, and of our subject areas is a prerequisite for our profession, but, alone, is not enough: whether we like it or not, we have to act as a business, just like other professionals. 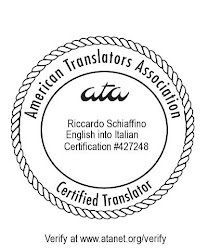 As translators, we are selling our services and running a business. Marketing, in a broad sense, at least, is any communication we have with a client or prospect: any e-mail, any phone call, any post that we make public on line, if we have a website or a blog. Marketing is also the communication we have with our customers when we send them an invoice or a payment reminder. Golden rule: put yourself in your customer's shoes: What would you like or dislike about the service you offer? What could you do to make your customer's life easier? If your direct contact with your customer is an overworked and underpaid PM who has to deal with the translation she sent you and with the same translation sent to translators for 11 other language pairs, plus another five multilingual projects at the same time, what could you do to help her? Not so much at networking events (where everybody is trying to sell and nobody wants to buy), but on other occasions as well: through LinkedIn groups or other on-line social networks, maybe, or by targeting a specific market, and then trying to see which of your friends or acquaintances could introduce you to it. 1.2 - Where and how? Frequency of marketing. Do not send a message just once, or twice and then give up, but eight, ten, or more times before getting a chance. In your web material, don't advertise: try to help solve a problem. By providing information you show you expertise. How do you make your customer successful? A good piece of advice from Judy was to barter for services, if necessary. For example, provide your services in exchange for good DTP or for a professional photo, or (for those of us who need marketing materials in a language which is not our native tongue) for professionally written copy. Know what you want out of the negotiation: the lowest rate you can live with, the shortest deadline, the longest payment terms. Put this in writing before you start negotiating. Thank you for sharing - some of the points are indeed insightful. Glad you liked the presentation, Riccardo. You did an excellent job at summarizing all the most important points -- wow! You must have taken really good notes. You also incorporated lots of good advice that others shared during my workshop. Thanks for posting this to share with others - the more colleagues I can share this information with, the better! Riccardo, I'm so glad you took these detailed notes to make up for the fact that I took none :) Seriously, this is so great, thanks very much! This is a great post and it looks like it was a really insightful event, thanks for sharing. The more information like this is shared with translators, the better our working conditions will become! Thanks for these great notes! They are better than mine (I was also there) - I will bookmark this article for future reference! Unfortunately, I wasn't able to attend the seminar and am very grateful to you, Richardo, for your detailed write-up. Thanks! Some excellent marketing ideas. Because I wasn't able to attend the conference, I am grateful to have been able to read these notes. Thanks very much for doing this. Thank you, Riccardo, for your insightful notes. There's priceless for our translation community. All points are well noted. Riccardo, you did a great job for all of us. Also thank you for all speakers who came to the meeting on a snowy slushy day! Thansk for the tips. Here's a related post. It can be useful as well. "Where to promote your translations and interpreting services for free"
Thank you so much for these notes! This is honestly one of your best articles. It's like a to-do's list and it’s great for any starting translators (and for some professionals too!). Most of us feel lost on how and where to start our own business and this – this wonderfully useful and absolutely magnificent article (I think I’ll just print it and stick it somewhere on my desk where I can see it and stare at it in awe) – saves us, like, years of painful “trial and error” time. Thanks again! Your article provides a good starting point for those who are developing a new business in the market.